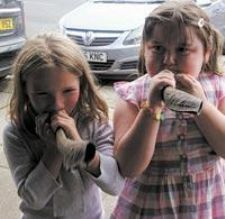 Over 180 people got ready for Rosh Hashanah by making their own shofar through a Whitefield Chabad workshop on Sunday. Parents were encouraged to bring their own power tools but children also got the chance to construct a shofar from a raw horn. They were told why it is sounded and about Rosh Hashanah and its customs. Whitefield Chabad director Rabbi Shmuli Jaffe said the idea was to have "adults working alongside their kids and helping each other. It was very interactive." The event was organised in conjunction with the London branch of Lubavitch educational organisation Tvios Hashem.